CarGurus has 58,150 nationwide Sierra 1500 listings starting at $2,500. The 6-speed automatic transmission shifts smoothly and imperceptibly most of the time, though under wide-open throttle it displays a characteristic jolt between gears. 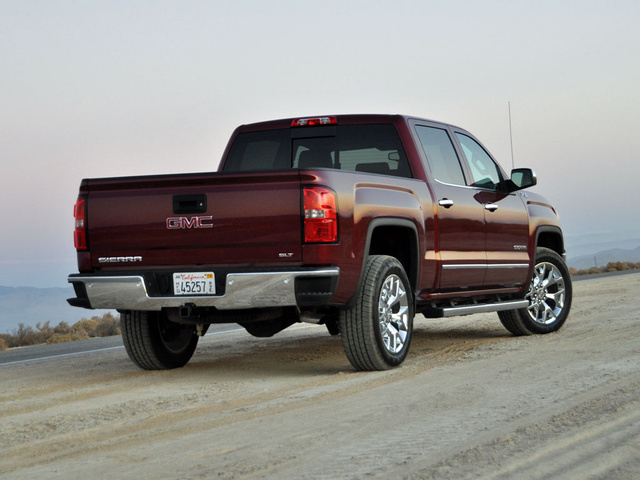 Redesigned for 2014, the all-new GMC Sierra 1500 represents a massive improvement upon its predecessor. It is more powerful and fuel-efficient, more comfortable and technologically sophisticated, able to tow and haul more weight and is safer than the truck it replaces. If this baked-in goodness ultimately translates to improved cost of ownership factors, the 2014 Sierra is the truck to beat. For now. General Motors could not have better timed the debut of the redesigned 2014 GMC Sierra 1500 full-size pickup truck. 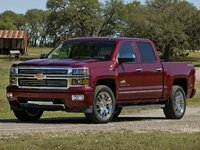 With the economy surging and big trucks in strong demand, the company easily cleared out inventories of the old model at the same time that it set the stage for the new Sierra to conquest owners of competing brands who might be getting back into the market for the first time in nearly a decade. If the new 2014 Sierra is successful at grabbing eyeballs and converting that attention into increased foot traffic at GMC dealerships, full-size pickup buyers will find a mighty appealing truck on the showroom floor. Initially, the Sierra 1500 is offered in Regular, Double and Crew Cab body styles, and in standard, SLE and SLT trim levels. The starting price is $25,085 for a Sierra Regular Cab with rear-wheel drive. That figure that can rise to over $55,000 for a Sierra SLT Crew Cab with 4-wheel drive and every option box checked. A luxury-themed Sierra Denali model is coming soon, and with an even bigger price tag. GM has also introduced a new 2014 Chevrolet Silverado, but I think the 2014 Sierra is the better looking of the two. From their windshields back, the Chevy and the GMC are nearly identical. Up front, however, the Sierra looks more upscale, refined and sophisticated, more like a real truck than a chrome-encrusted billboard advertising a gold Chevy bowtie. The polished 20-inch aluminum wheels on my Sonoma Red GMC Sierra SLT test model are extremely appealing, too. The GMC’s interior represents a significant upgrade over the old Sierra. For 2014, the Sierra’s cabin makes use of soft-touch surfaces, a premium headliner and in many models, genuine aluminum trim. Fake wood is still present inside the SLT model, but it’s more convincing this year. In addition to exhibiting greater quality, the Sierra’s new interior looks more rugged and industrial than before. Previously, the more expensive versions of the Sierra shared an instrument panel with the Yukon and Yukon XL SUVs, one that looked and worked like it belonged in a car rather than a truck. No more. There’s no mistaking the Sierra for anything but a full-size pickup truck when you’re sitting behind the wheel. 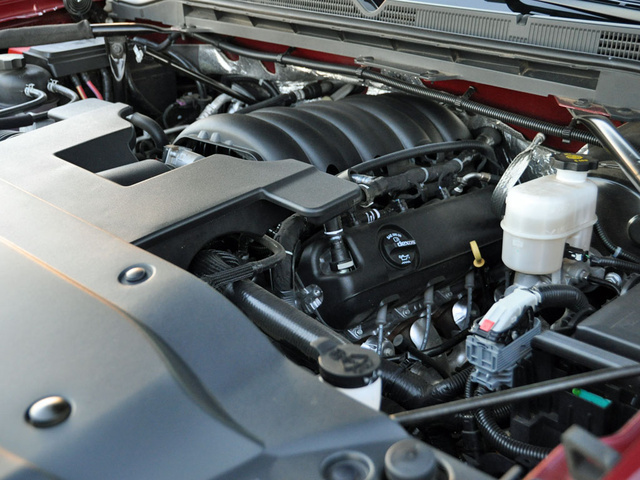 For the 2014 Sierra, GMC offers a choice between a 4.3-liter V6 engine, a 5.3-liter V8 engine, and a 6.2-liter V8 engine, each equipped with direct fuel injection, variable valve timing and Active Fuel Management technology that operates the engine on just 4 cylinders under low-load driving conditions in order to conserve fuel. Each engine is E85 compatible, and a 6-speed automatic is the only transmission available, delivering the power to the rear wheels. A 4-wheel-drive system is optional. My 2014 Sierra SLT Crew Cab 4WD test truck came equipped with what is expected to the most popular engine, a 5.3-liter V8 making 355 hp at 5,600 rpm and 383 lb-ft of torque at 4,100 rpm. When properly equipped, a Sierra with this engine tows as much as 11,500 pounds and hauls up to 2,102 pounds of payload. The EPA rates the Sierra 4WD equipped with the 5.3-liter V8 to return 16 mpg city/22 highway/18 combined. I got 16.7 mpg from my test truck, and that included plenty of highway driving with just one person aboard and nothing in the cargo area. My bet is that most people won’t be happy that their trucks aren’t getting the fuel economy promised by the window sticker. It’s not for GMC’s lack of trying. 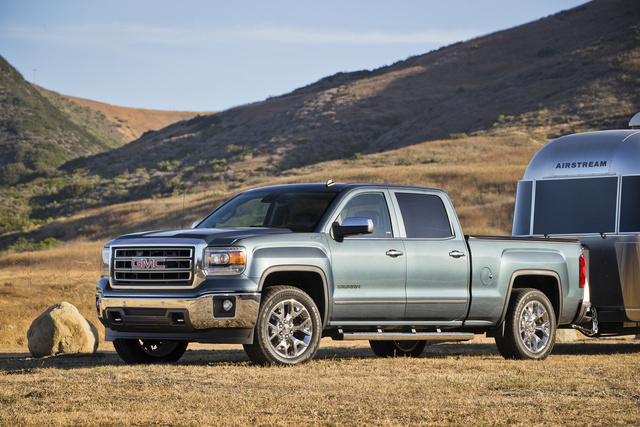 The new 2014 Sierra’s Active Fuel Management technology is calibrated to spend more time operating in V4 mode in order to improve fuel economy. Occasionally, when the system switches from V4 to V8 operation, there is a delay as all 8 cylinders come on line. Again, this isn’t necessarily unpleasant, as long as you know what it is you’re feeling and why you’re feeling it. Throttle tip-in, the way the accelerator pedal responds when you push on it, won’t please people who like an instantaneous wave of thrust the moment they step on the gas. Instead, the Sierra’s accelerator is calibrated to gently roll into the truck’s power band, forcing the driver to push the pedal deep to get the pickup moving with authority. Whether this represents a concession to improving fuel economy by dissuading speedy off-the-line acceleration or is designed to assist when towing, the effect is to make the Sierra a smooth-driving machine. There’s no lack of power here if you stomp on the gas, such as when merging onto a freeway or getting up to speed on a country highway. The 6-speed automatic transmission shifts smoothly and imperceptibly most of the time, though under wide-open throttle it displays a characteristic jolt between gears. GMC has done an excellent job of tuning the Sierra’s variable-assist electric steering and suspension. Though my test truck had the Z71 off-road package, it didn’t produce an excessively stiff or jarring ride quality on poorly maintained pavement. Instead, my test truck exhibited a surprisingly quiet and composed highway ride combined with excellent roll control in corners. These favorable paved-road manners didn’t force the Sierra Z71 to relinquish any talent on off-road trails, where it proved adept at 4-wheeling. There’s one thing to keep in mind, though, especially with the Sierra Crew Cab, and that’s a shallow breakover angle. At a media event, under the guidance of an off-roading instructor, I was able to sample the essentially identical Chevy Silverado Crew Cab Z71 on a difficult trail. The Hill Descent Control system and 4-Lo gearing allowed me to crawl down a 30% grade nose first, and without ripping the truck’s air dam off at the bottom of the hill or catching the rear bumper as I came down off the hill. But, when I scampered up and over the next hill, the running board mounts got caught when the truck bottomed on the trail, severely bending them in the process. As always, it is best to know something about the terrain you are traversing in advance of actually traversing it. Compared to the old Sierra, this new 2014 Sierra is a huge leap forward in terms of materials, design, layout and user-friendliness. Nothing inside the Sierra SLT instantly identifies itself as “cheap,” and the front portion of the cabin features soft-touch surfaces on the dashboard and upper door panels, as well as genuine aluminum dashboard trim. The truck’s new front seats deliver excellent long-distance comfort. I spent hours at a time in the saddle, and except for wanting a telescopic steering wheel, had no complaints. My Sierra Crew Cab’s rear seat represents a big improvement over the tight quarters of the previous-generation Sierra, with the new truck providing generous leg and foot space, combined with wider rear doors for easier entry and exit. However, absolutely everyone I put back there wanted to know why a $50,000 truck didn’t have air conditioning vents for rear seat occupants. Another upgrade with the new Sierra is that the driver can operate the majority of the controls while wearing work gloves. With the previous-generation Sierra, GMC forgot that truck buyers tend to wear those. One feature that might not work so well while wearing gloves is the next-generation GMC IntelliLink infotainment system, which requires the use of a touchscreen to execute commands. Dramatically improved in terms of graphics, screen and virtual button size, and functionality, GMC IntelliLink is a thoroughly modern, smartphone-compatible system. My test truck also included no fewer than 5 USB ports between the dashboard and the center console, plus a 3-prong household-style power outlet on the control panel. 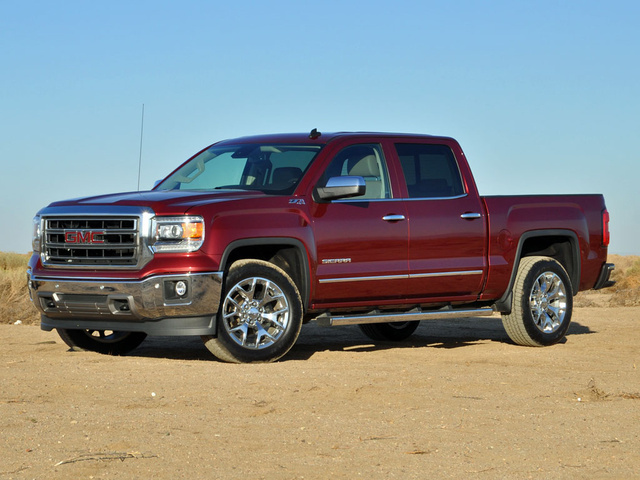 Pickups are designed to carry stuff, and the new 2014 Sierra excels on this front. Inside, GMC installs a variety of covered and open storage solutions, from triple-level trays and bins punched into the door panels to a huge center console box and dual gloveboxes. Outside, handy steps are standard for the Sierra’s rear bumper corners, making it easier to secure a load in the 2-tier cargo box. My Sierra SLT test truck also included an EZ Lift and Lower tailgate, LED under-rail bed lighting, upper tie-down hooks for the bed and a spray-in bed liner. It is super easy to pair a phone to the Sierra’s new version of GMC IntelliLink, and once your smartphone is connected, the natural voice recognition technology proves far easier and more intuitive for making calls and executing commands. The color 8-inch screen displays pleasing graphics, large icons and touch-sensitive buttons, and a “Home” button under the screen makes it easy to “start over” or to switch menus. 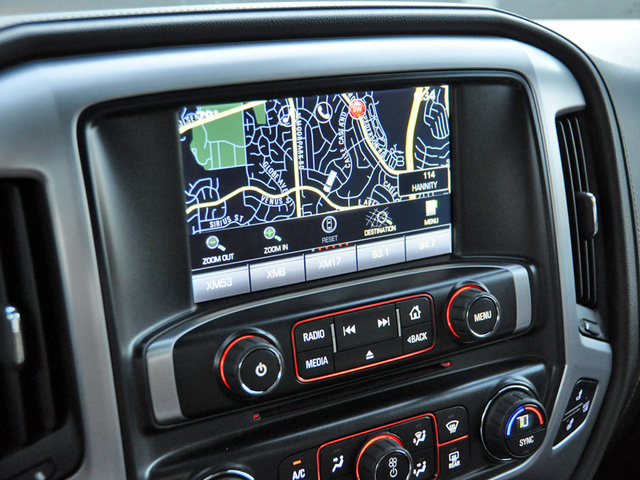 GMC also provides big knobs and buttons to control primary radio and climate functions so that you don’t need to use the screen for common adjustments. In addition to IntelliLink and a long list of available new safety technologies, the Sierra is equipped with standard Trailer Sway Control and Hill Start Assist, and it can be optioned with Hill Descent Control and an Integrated Trailer Brake Controller. A 6-month subscription to OnStar telematics service comes with nearly all the new Sierra trucks, and it includes safety, navigation and assistance services that are just a touch of a button away. Although a standard GMC Sierra is designed to serve as an affordable work truck, most models come standard with OnStar telematics and a reversing camera. OnStar offers a free 6-month trial subscription to services including Automatic Crash Response, Crisis Assist and Emergency Services, each putting the truck’s occupants in touch with a person who can help—even if a crash has left the driver and passengers unconscious. Additionally, most 2014 Sierra models are equipped with a reversing camera, and GMC offers a surprisingly affordable Driver Alert Package containing front and rear parking assist sensors, Forward Collision Warning, Lane Departure Warning and a Safety Alert Seat that vibrates if the driver veers out of a lane. A Side Blind Zone Alert system is notably absent here, especially because the truck doesn’t have integrated blind-spot mirrors. As for crash-test performance, the Sierra Crew Cab earns a 5-star overall rating from the National Highway Traffic Safety Administration (NHTSA), combined with a 4-star rollover rating for both rear-drive and 4-wheel-drive trims. If there’s an area where the new 2014 GMC Sierra has its work cut out for it, cost effectiveness is it. For example, my observed fuel economy rating of 16.7 mpg barely exceeded the official EPA city rating, and I spent a whole bunch of time driving this truck on the freeway without passengers or cargo. Additionally, while it might be unfair to judge a completely redesigned truck with completely new powertrains by its historical performance, all previous Sierras ranked average in terms of reliability, depreciation over time and cost of ownership over time. The one area where the Sierra has frequently shined is with regard to the annual J.D. Power Initial Quality Study, where the Sierra has consistently impressed its owners during the first 90 days of ownership. As far as making a deal, GMC isn’t taking any chances with the 2014 Sierra, no matter how good the truck is. Just a couple of months after its debut, the new Sierra is available with a choice between a $1,000 rebate, 60-month financing at 2.9% APR and a subsidized lease payment. Oh, one more thing, for all you “Buy American” types. My Sierra SLT Crew Cab was built in Mexico, and while the engine and transmission were sourced in the U.S., more than half of the parts that went into this GMC were produced in Mexico. 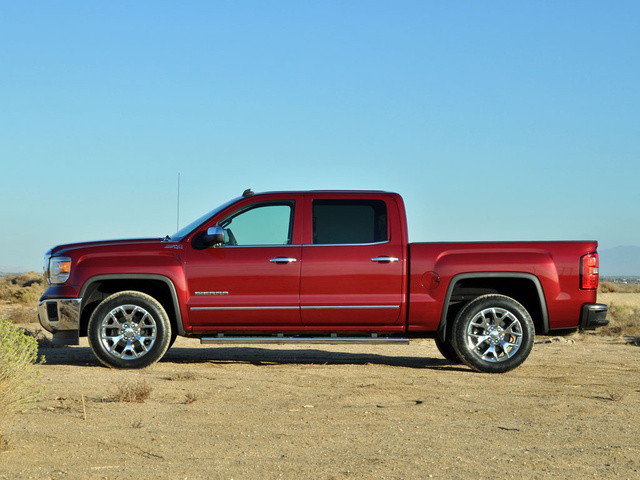 What's your take on the 2014 GMC Sierra 1500? GMPerformance Couple things, the 2014 6.2L engines are NOT e85 compatible. I get over 20mpg+ on the highway with my 6.2L so maybe your shoes have heavy soles . and finally, 51% of the PARTS were made in Mexico. the rest are made in US and Canada the truck's final assembly plant is in Roanoke, Indiana. Please get your facts strait before spewing out false information. Dave 51% would be more than half of the parts! Which fact is it you are correcting? 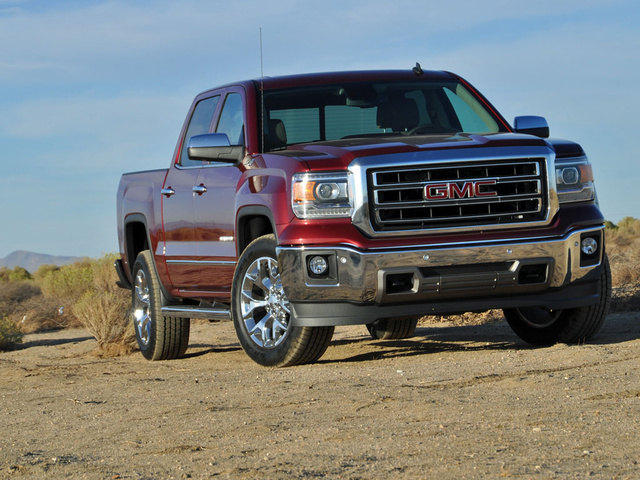 Users ranked 2014 GMC Sierra 1500 against other cars which they drove/owned. Each ranking was based on 9 categories. Here is the summary of top rankings. Have you driven a 2014 GMC Sierra 1500? Where can I get a wiring diagram that shows all the 4 WD wiring ?